Happy Tuesday, Friends! Today I want to share with you some adorable little chandeliers I found for my brother and sister in law’s house. You won’t believe the transformation! This was a petite chandelier rescue if there ever was one! A few years ago my brother’s kitchen completely flooded thanks to a faulty water line in the refrigerator. Bad news, nearly the entire first floor and basement were flooded. Good news? Their insurance paid (mostly) for a complete remodel of their kitchen! So, in the new kitchen, they completely changed the size and shape of the center island. Also, a complete stroke of good luck, there were two existing can lights over the island allowing for double chandeliers! And what could be more perfect? Double the fun! So, while out shopping at one of my favorite antique stores I spotted these two petite chandeliers. They looked a bit forlorn with their tattered shades and layers of dirt, but I knew with a little TLC they would be perfect for my brother’s kitchen! So, I snapped a picture with my cell phone and sent it to my brother’s wife. She loved them! She too could see their potential. The price tag said $150 for the pair but I knew they had been there for months. I asked the store manager if he would take $100 cash and he said yes! As you know, petite chandeliers like these can be pretty expensive so $50 each was a great deal! I loaded them up and off to Troutman they went! This is how they look in my brother and sister-in-law’s new kitchen. My sister-in-law trashed the original shades since they were in such bad shape. She purchased these small white linen shades and glued beaded crystal trim along the bottom edges. Magnetic crystals complete the new look! Great job, Shana! I love how the silver on the petite chandeliers matches the new shiny stainless steel appliances. 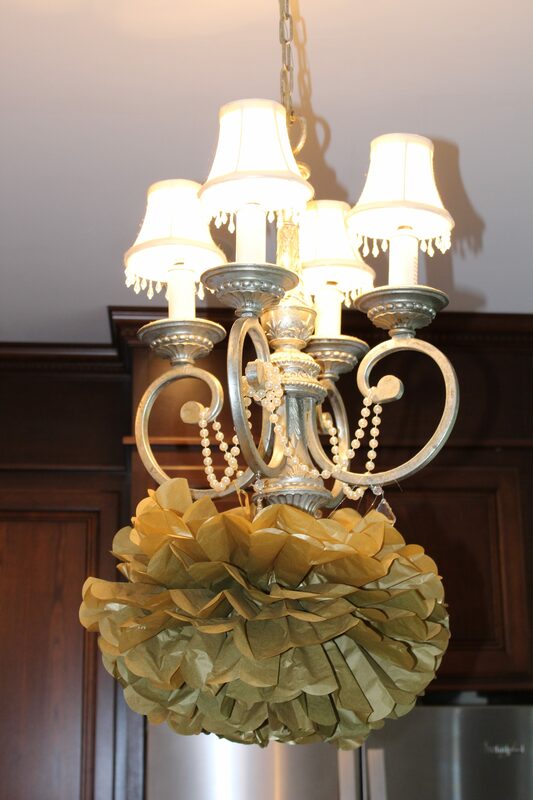 And for my future daughter-in-law’s bridal shower a few weeks ago, the chandeliers got even more glamorous with fluffy gold paper flowers and strands of pearls. Paint Samples to the Rescue!